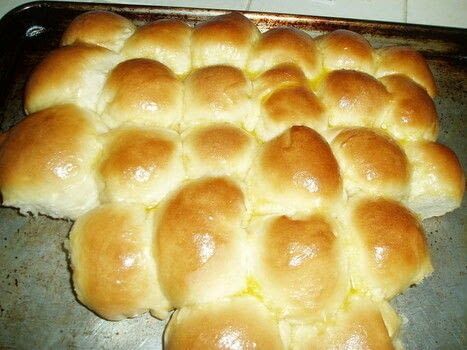 https://www.cutoutandkeep.net/projects/bread-machine-jiffy-rolls • Posted by mars f.
In bread machine pan put water, then salt, the cake mix and flour top with the yeast and put it on the dough cycle. When cycle is complete remove from bread machine, I don't flour my rolling board I oil it so do what you prefer and cut and then roll into 15 to 20 rolls, put on a greased baking sheet cover and let rise till double about an hour. Bake at 400 10 to 15 minutes. You can also do this w/o a bread machine I am just lazy. I had a pretty pan full buut when I went to answer the phone my son and his friends raided my kitchen. God save me from hungry teenage boys!